Whether you’re a new skier or you were raised on the slopes, getting fit for ski season can be tough. 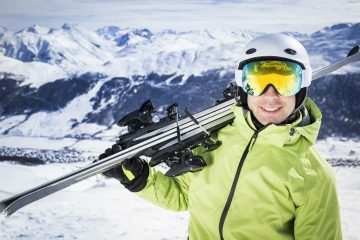 Skiing takes a unique mix of cardio, strength and balance training to avoid injury and reach peak performance. But, that doesn’t mean it has to be complex or overwhelming. 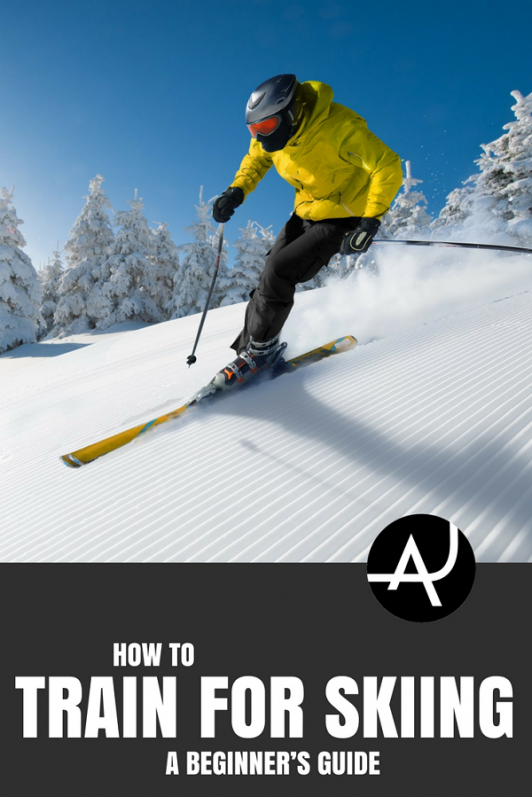 If you’re not sure how to train for skiing or if you just want some new ideas, we’ll break down each element of the exercise and offer you a few tips on what to incorporate into your routine. Never fear! Even if your current fitness practice is limited to doing marathons of TV shows, The Adventure Junkies can help set you on the right course. A bit of time invested to learn how to train for skiing will pay off once the snow starts to fall. Read on for our best suggestions on how to get ready for the skiing season. Skiing is a blast, but it is also a great workout. Just like running or hiking, skiing demands a basic cardio fitness level. To maximize your training for skiing, you’ll need to expand your routine beyond cardio. 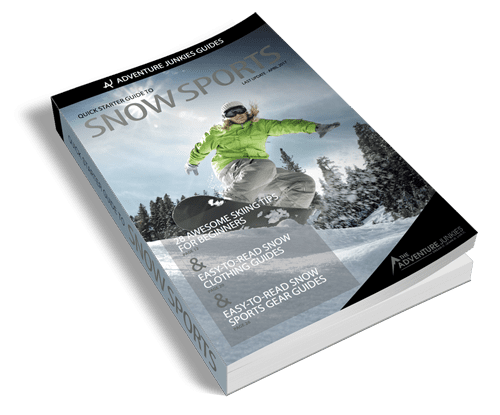 The thing is, training regimens can be confusing and overwhelming especially for casual skiers or people who aren’t as active in the offseason. 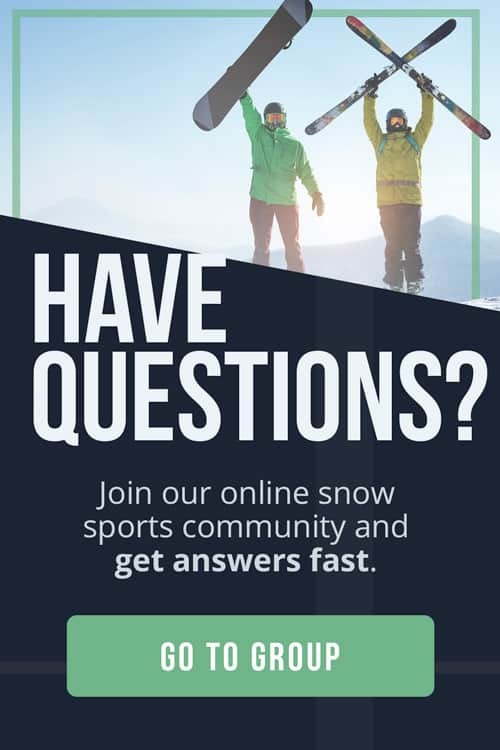 So, where should you begin when you want to know how to train for skiing? The Denver Post interviewed six fitness trainers to help prepare weekend warriors for another season on the slopes. The trainers all agreed that endurance, stability, balance and flexibility are crucial factors to improving your performance and preventing potential injury. A training routine that focuses on each element will set you up for success and lower your chances of getting injured, so you can enjoy skiing all season long. Skiing is like a marathon. If all goes well, you can be outside for hours on end either riding the lifts or skinning up the mountain. REI.com explains in their basic training guide that whether you plan to ski straight from top to bottom of the mountain or stop along the run for photo ops and rest breaks, interval training should be part of your preparation. Interval training will let you build endurance with low-intensity cardio combined with high-intensity intervals. When training in high-intensity intervals, focus on including five to 10 intervals of 30–120 seconds each. Allot about a minute to recover in between each interval. Any form of cardio – from running to swimming – will help. To mimic the muscles used in skiing, the Telegraph suggests integrating workouts on a step machine or bicycle. One of the challenges of skiing is the variable terrain. There is always the possibility that you’ll find yourself on nicely groomed runs, or darting between the trees in knee-deep powder. Regardless of the surface, you’ll be in great shape if you can increase your core strength and overall stability. A great way to mimic the unpredictability of the ski slopes is to train on diverse surfaces. 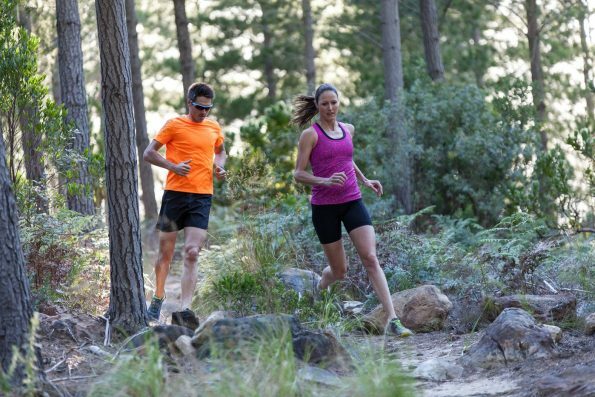 Running on a trail or on sandy surfaces is a good option. Your legs and ankles have to adapt quickly to diverse conditions. This is also a good way to build your core strength. Another great tactic, especially if you’re focused on gym workouts, is to build eccentric leg strength. 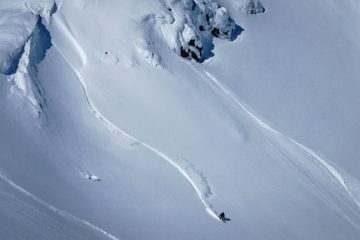 Backcountry.com interviewed Rob Shaul, owner of the Mountain Athlete training center in Jackson, Wyoming, who defined eccentric leg strength as the strength used to lower yourself into the bottom of the squat or hike downhill. Eccentric leg strength is a key factor in the endurance and strength needed for a long day of skiing. Balance goes hand-in-hand with stability. Working on your sense of balance will help your ski form and performance, especially on steeps and moguls. At the most basic level, balance will let you stay upright and standing on your skis. If you’re a brand new skier, balance is perhaps the most important skill to develop. Specific attention to the adductor and abductor muscles will help create better balance, increase your leg strength and stability and protect your knees. 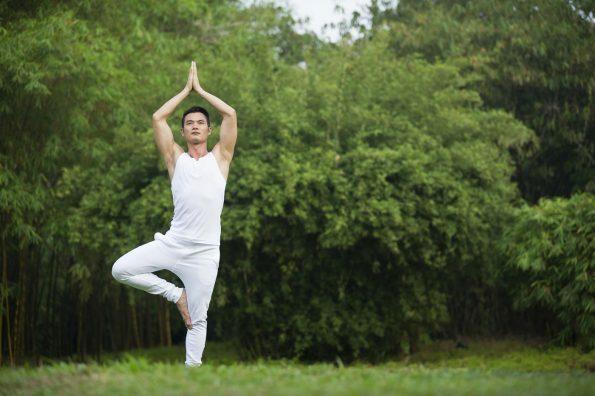 Improving your balance will help your body maintain its best position in any circumstance. Balance will also make all of your other ski skills feel a little easier to maximize. Flexibility helps your body, and especially your knees, react to the unpredictable surfaces of the ski slope. ESPN featured five yoga moves designed for the skier, pointing out that open and flexible hips are essential to protect the knees in the event you hit an unstable surface. Improving your flexibility will also provide a bonus when your friends are filming your descent as you’ll be able to fall more gracefully. The importance of flexibility extends beyond the ski season. If you are active in the offseason, be sure you take care of your knees and other joints when hiking, running or lifting. Avoiding injury and establishing good habits will prepare your body to take on the added stress of snow and steep slopes. 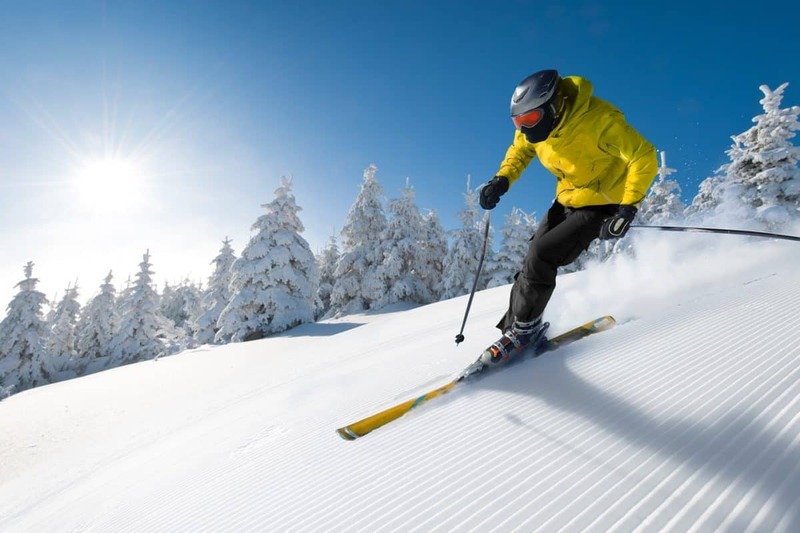 Ultimately, the best way to train for skiing is to incorporate a blend of activities that will cross-train your body and hit on all four of the key points, namely, endurance, stability, balance and flexibility. Consider adding activities, such as yoga, that focus on more than one area of development. A yoga class can help you with stability, balance and flexibility. Likewise, strength training will improve your endurance and stability. Finding a similar activity that you can do in the summer is also a great way to train for skiing. Lots of the same principles apply for summer hiking and backpacking, especially when it comes to ascending and descending on rough or steep terrain. Hiking up a mountain will test your endurance, while the hike down will help build balance and stability as you avoid slipping on loose rocks or gravel. The Adventure Junkies’ guide on how to train for hiking is a great resource on how to take advantage of the warmer season. Need more inspiration? Check out these five essential preseason training moves used by the U.S. Ski Team. These simple exercises, which are focused on building a strong core and legs, will help anyone prepare for a better ski season!